There’s nothing that will compare to a plate of pasta with alfredo sauce. The sauce is not only rich, delicious, thick and creamy but also has a pack of nutrients. It gets its rich flavor from parmesan cheese. Most people argue that they can make their own sauce at home so there’s no need to buy. But it will take you a lot of time and effort. Additionally, unless you are a champ at making the sauce you might not even get a quality sauce in the end. Although store-bought Alfredo sauce is mostly perfectly rich, some may taste bland. Choosing the best from the many brands isn’t easy. This article will help you choose the great tasting sauce that is made using natural herbs and spices. I know there are many sauces that are usually white or cream in color. 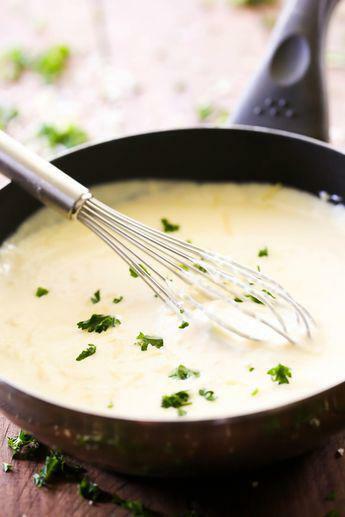 But Alfredo sauce is a distinct white or cream sauce made using butter, parmesan cheese and heavy cream. Some brands may add garlic, salt, pepper and other spices to make it taste even better. Contrary to most beliefs though, the traditional Italian alfredo sauce has no cream in it. The above version which equally tastes great is an American style. The Italian one, however, is made using roman pecorino cheese and butter. Never at all containing cream. Some would ask, then why is it creamy and the reason for its creamy texture is the starchy pasta water. I would say, the tastes solidly depend on the how you make your sauce and the ingredients you used. But generally, it should be creamy, soft and cheese like. The sauce makes your pasta rich living you with a dense mouthfeel. 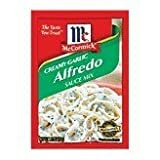 Whenever I’m looking for alfredo sauce, I normally go for the creamy and fair flavor although sometimes I go for the one with a robust flavor. Precisely, the traditional brands offer the classic flavor that works well as white gravy. There are stronger tasting ones that will work well with your veggies and meats. If you would love to understand this sauce best, buy a variety of alfredo sauce with varying flavors. Do you want it in powder form or fresh alfredo sauce? Here, the question is more about how long you wish the sauce to take in your pantry. 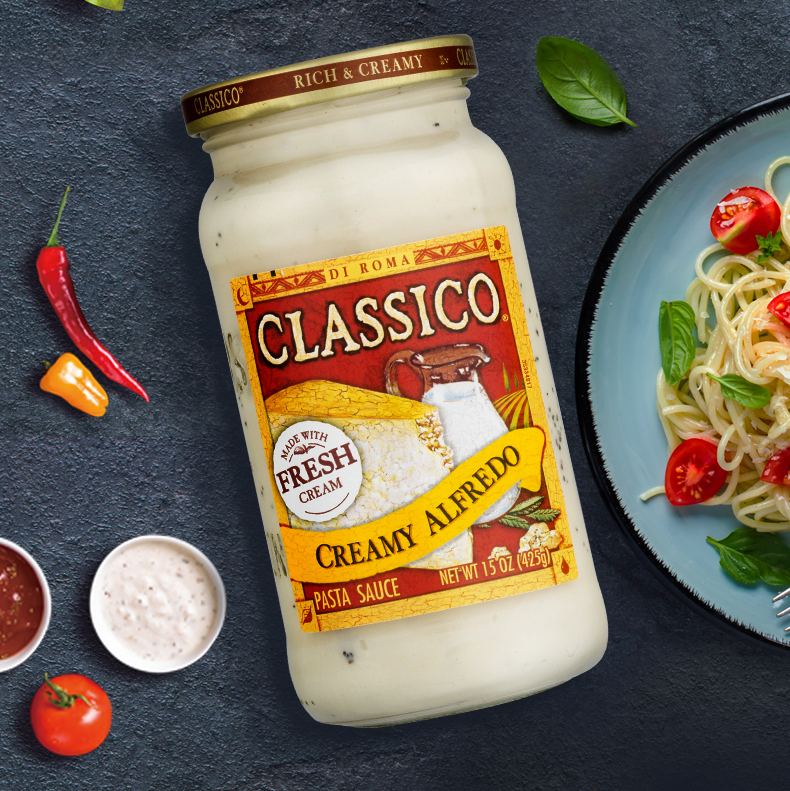 To be honest, I like my sauce fresh that’s because I find it hard to resist the only original alfredo sauce and the asiago classic alfredo sauce. I believe they use fresh cheese and cream. The powder sauce, on the other hand, will deliver a thick base for any of your meals and not require refrigeration. This is your pantry staple and here you can choose between McCormick creamy alfredo and Knorr classic. Yes, of course, today the market demands the use of healthy foods. This doesn’t live out sauces like alfredo. 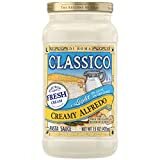 If you like your sauce organic you can buy simply organic alfredo while for the light option you can buy classic asiago Romano Alfredo sauce. Do you like the ones that are full of flavors and work best with your meats and veggies? You can also get bottled alfredo sauce that is tasty and goes well with your meats and veggies. The popular option in this category is Prego alfredo sauce. it contains bacon. Another choice is stonewall kitchen basil alfredo that you may even use in your pizzas. You will come up with a lot more after trying the options above. Go for a wide range of options to know which one best suit your palate needs. They come in different quantities with the aim of suiting different consumer needs. There are manufacturers that will play the price trick on you. They will place a small price tag on a large quantity of alfredo so that they lure you into buying the large quantity. Bottom line, don’t fall or this trap, consider the family size before buying it. You don’t want to store the sauce longer than you should. Since the initial sauce, different manufacturers and chefs have altered the initial ingredients that were used in making it. If you are familiar with the ingredients that should make the sauce you can check the package for the desired ingredients. The ingredients used determine the sauce texture and flavors. Some brands use sugar to make the sauce. Ensure that the amount of sugar used is minimal. Moreover, the use of sodium in the sauce should be minimal because of the health risks involved in consuming a high level of sodium. In summary, whenever you are buying this sauce be careful that you pick sauces that won’t pose a health risk especially if you have allergens. Although most alfredo sauces are designed to enhance the pasta flavor, you can use some of those sauces on other meals. Make sure you buy a sauce that you can use in a variety of meals you love aside from pasta. It’s true that the sauces here are a pack of nutrients. However, confirm its fat content before you buy it. Some sauces may contain high-fat content which ultimately causes a health hazard especially to people looking to shed some extra weight. Generally, the alfredo sauce contains a high content of fat that means you should use it cautiously. The sauces price is determined by the quantity, brand, ingredients used and the quality. What I’m sure of is that you will get a good product with whichever price range you set. Bertoli is the name people associate with alfredo sauce brand. Probably because it’s the traditional one. It’s made using aged parmesan cheese, Romano cheese and sometimes fresh cream. This is your quick sauce when you are looking for something authentic and salty. In fact, most chef, associate it with richness and bold flavors. This is attributed to the fact that the sauce is a house of essential vitamins and other nutrients. It enriches your pasta giving it a perfect texture color and flavors. Aside from using it on pasta, you can use it on seafood and different meats. Its package is on itself attractive yet it’s a blend of different spices and natural flavors. It never uses preservatives at all. For the most part, this is the one I love because of its cheesy taste. Although it contains no preservatives it’s never that easy to make at home. 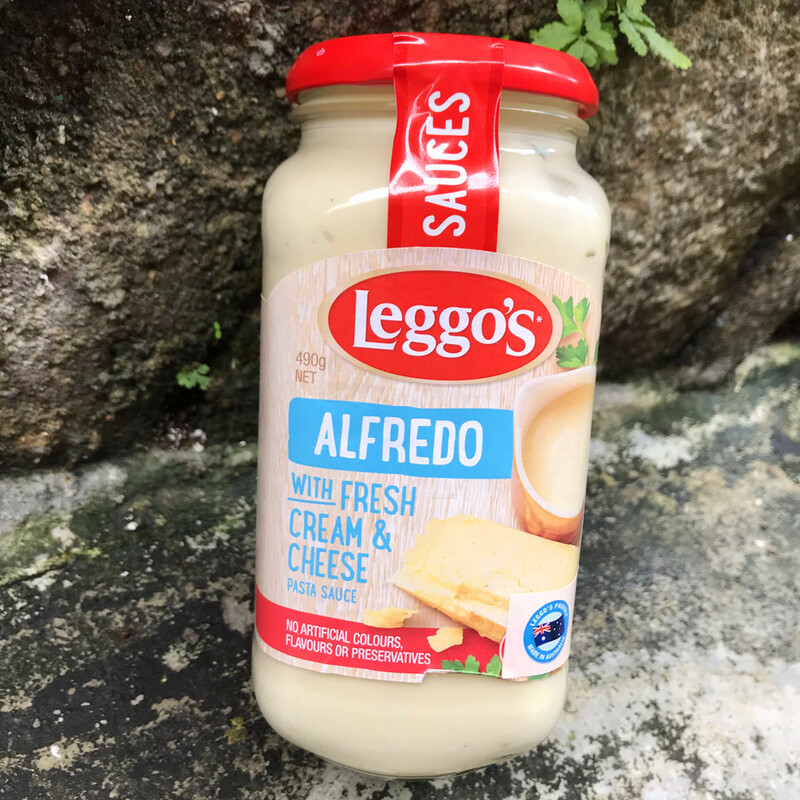 Be informed that unlike other alfredo sauces, this one isn’t bland and paste-like because it contains a blend of spices. Anytime I think of pasta, I can’t help but think of barilla sauce. The sauce is the best fit when it comes to making the different types of pasta. People love it in the fettuccine noodles just as much as they do with jumbo shells. The sauce fits with almost any kind of pasta is because of its creamy texture. Whenever you intend to serve a hearty meal to your unexpected guests, this sauce will work best. Mind you, it’s made with high-quality ingredients that deliver a smooth, balanced flavor to your meals. The ingredients used include the real cream, Romano and parmesan cheese that will fit your different kinds of Italian pasta. If you didn’t know, this sauce shouldn’t miss on your pantry. It contains a reasonable amount of salt and it has a perfect consistency than most other alfredo sauces. For the rich taste and the thick consistency, the ingredients used in making Barilla are simmered together over a short duration of time. The light sauces are designed to reduce the intake of calories and fat. This sauce will deliver a creamy pasta dish but with less fat and consequently fewer calories than normal. Sticking to a healthy diet doesn’t have to be boring. You can use this sauce to spice up your meals and still maintain the proper health. It’s a good alternative to the standard alfredo sauce. It’s made using asiago cheese which is a unique kind of cheese, Romano and parmesan cheese. The three kinds of cheese are blended in cream which gives it a perfect texture. It further contains no gluten. Since it’s made using natural ingredients, you cut down the need to use preservatives. Mind you, it tastes perfectly even though its light. In fact, its close in taste to other Classic alfredo tastes. The only thing that happens is that it tones down on fat but the flavors are maintained. This means that you can add it to your tuna, chicken, veggie salads and casseroles. 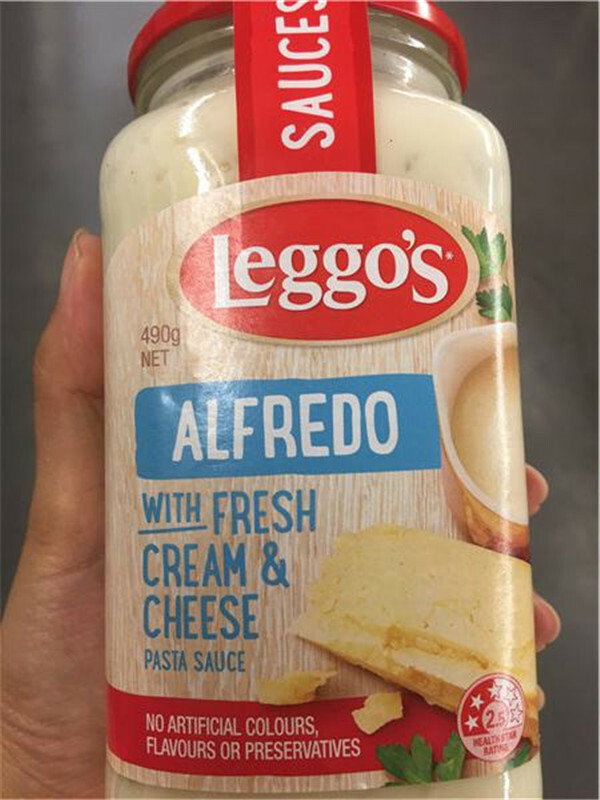 Compared to most other alfredo sauces even those that are said to be light, this sauce contains lesser calories than most. In addition, it contains black pepper which gives you the perfect aroma and a tingly sensation. When you have alfredo sauce in a jar you can make pasta with it. This meal doesn’t need a lot of work and its perfect for your dinner. All you do is cook the pasta then heat the sauce and you blend them together to have a sumptuous meal. After cooking your pasta, you then figure out how to mix it with the sauce. Remember, for effectivity, you need the same amount of sauce as the amount of pasta you are making. For example, if you are making pasta for 2, seclude the sauce portion for two. Using a large pan that will fit both the pasta and the sauce, pour the sauce in the pan. Add the pasta to the pan with the sauce. Stir them together for about 3 minutes giving it time to blend in properly. After 3 minutes, remove from the heat source and serve. If you like, you can add your favorite toppings which include parsley and cheese. This is a sauce mix that you must have on your pantry but you don’t have to worry about the storage. Making the alfredo sauce with this one is easy since you only need butter and milk. It makes a flavorful sauce as the pasta is cooking. Add the cup of milk and a packet of Mc Cormick mix them and stir until well blended. Keep cooking under medium heat as you simmer for 2 minutes as you stir occasionally. Let the sauce thicken and serve over pasta. This will work as the best choice for those days that you work late and you only need to fix a quick late meal. Consider that this one is a garlic flavored one though, so, if you don’t like garlic, it may not work for you. The sauce is made without MSG. It contains natural spices and flavors which include Romano, fat-free milk and parmesan cheese. This is the store-bought sauce mix that gives you something close to the homemade sauce. It contains no artificial flavors which makes it a good choice for your entire family. For all of you who want to taste Italian delicacy, this is your best bet. I love bacon, but do you? This sauce best suits bacon lovers because it contains real bacon for an enhanced taste. It works for your lunch or dinner meals especially if you have kids. What’s more, this one comes with peppercorn bits. For me, it works with other meat products like the turkey, chicken, hamburger and sometimes salads. It equally works for pasta and noodles. Don’t be misled by the slender jar because it will serve a whole lot of various meals you need. Note that, the sauce has a unique packaging which makes it easy to see it. You can even see the bacon pieces since the container is transparent. What I like about bacon is that it adds flavour to my sauce and ultimately meal. Unlike the above sauces, this one is made with fresh cream and real cheese. The creamy cheese will be your ultimate favorite at all dinner tables. 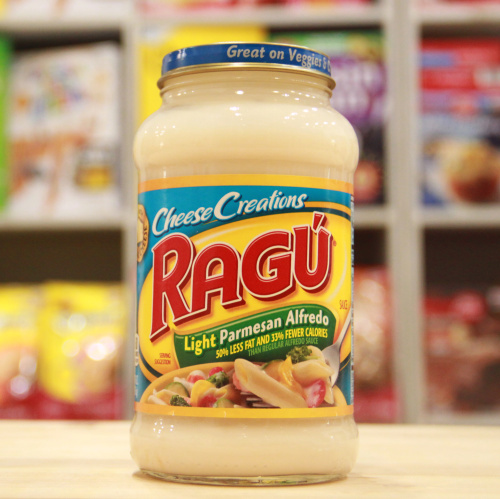 If you love the authentic cheesy taste of the alfredo sauce then this is your best choice. This is an award-winning sauce. The sauce has its roots back to the founder of Alfredo sauce called Alfredo di Lelio. The dish called fettuccine alfredo was an authentic dish of ristorante il vero alfredo. This is where the founder of the source had his restaurant in Italy. A century after its invention, the cooks who operate the restaurant invented the sauce to be used at home by home cooks. Now, this sauce has brought the fettuccine home. Made using all the natural ingredients this sauce will leave you licking your fingers. Unlike the sauce’s competitor that has a whole bunch of ingredients, this one features only a blend of four natural ingredients. They include Parmigiano Reggiano, olive oil, salted butter and cultured skim milk. Be sure to refrigerate this sauce as it only features high-quality fresh ingredients. Thanks for the il vero alfredo restaurant staff since we can still enjoy the authentic alfredo recipe. It’s no wonder it continues to win awards like the sofi award, the new product pasta sauce category among others. One thing to note is that the organic alfredo sauce is made using ingredients that are processed without the use of toxic pesticides or GMOs. It contains milk and its vegan-friendly. Its free of gluten and it offers you the easy way to make your own alfredo sauce at home. It’s USDA certified making it suitable for use even after storing it on your pantry for long. It suits any member of the family who is concerned about their health. Moreover, it works well for those who love making their homemade sauce to retain the authentic flavors without preservatives. Your fettuccini recipes may have more organic flavors while maintaining a balance of salt and butter. 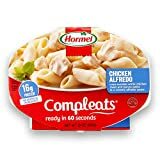 For the generous serving of meat yet delicious quick meal, buy Hormel Compleats. This features the oven roasted chicken pieces and penne pasta in your creamy alfredo sauces. With this you don’t need a refrigerator you can display it on your pantry. This is specifically suitable for those who are busy because it will only take you 60 seconds to make. This is a full balanced hearty meal that uses no artificial ingredients for preservation. It further has the perfect packaging that makes it easy to carry to your office, gym or have it at home. What I love the more is that it will take me only a minute to have a meal on my table. For all those who love Mexican cuisines, here’s something for you. It’s famously referred to as Mario Batali and it was founded by the iron chef series. Like most other sauces discussed above, Mario Batali uses only fresh ingredients to come up with an authentic sauce. Again, this is a favorite to many who have a squeezed schedule and are forced to eat very fast. What makes it suit the Mexican dishes are the ingredients used to make it. They may include dried red chilis which is famously used in Mexico. 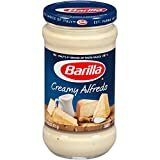 If you know the difference between the homemade alfredo sauce and store bought one you will be able to tell when you taste it whether a sauce is store-bought or not. To remove that taste, you can do the following. Warm your jar of pasta on a stove. As this is happening, add a tablespoon of real butter, minced garlic, grated parmesan cheese, fresh black pepper, steamed fresh broccoli then dried basil. You can also add a few pieces of bacon if you like. At the end when it’s about to get cooked, add either cooked shrimp or chicken. Go ahead and pour the mix over your cooked and drained pasta. Serve hot after garnishing with parsley or basil. You can serve with French bread and salad. Assuming you already know how to cook the alfredo sauce, you may use any of the 4 methods below. The flour never influences the taste of the sauce but, remember to use a limited amount of flour. As the sauce is simmering, dilute 3 tablespoons of flour in water then add it to the simmering sauce and continue to stir. Stir it on and on until the sauce reaches your desired consistency. Now, not many people like the idea of using flour in their Alfredo. In that case, use the corn-starch method which allows you to even reheat the remaining sauce with ease. In a cup of water, add a tablespoon of corn-starch. Add the mixture to the simmering sauce and stir to thicken. Egg yolk works as a thickener for any recipe that has used cream or milk. Here, bring your alfredo sauce to a warm temperature. Add the egg yolk and stir to maintain an even consistency. Once the yolk is nicely mixed in the sauce, turn the heat on again and let it cook to perfection. How Long Does Alfredo Sauce Last? Alfredo sauce is very versatile. Especially once its opened. The sauce even when stored in the refrigerated within the 4-5 days after which you have no choice but discard it. The best option is to eat it all that why it’s often advisable to buy the amount of sauce you will finish quickly. This is true for even the homemade alfredo sauce. Now you have all the info you need at your fingertips. Get out and select the best oil above from your grocery store or supermarkets. They are all the best option for the different categories.